Hannah is a PhD candidate studying infectious disease epidemiology. At age five she conducted her first food rescue when her family had extra veggies harvested from their garden. Equipped with a little red wagon, she brought zucchini, pumpkins, tomatoes, carrots and as many icky radishes as she could “rescue” door to door to her neighbors. Since age five, Hannah has warmed up to radishes. When Kelzee moved to Minnesota in 2011, she was overwhelmed by the strength of the social justice movement in the Twin Cities, and the beautiful ways it connects and empowers people. After searching for her place among it all, she found it in food waste reduction when she once drank two gallons of milk in a day to keep them out of the trash. Thanks to TCFJ, she’s now putting her skills to better use exploring new, creative relationships with partners, communicating freely with people interested in the food justice cause, and leading the bike rescue program. Outside of TCFJ, Kelzee enjoys the occasional triathlon, exploring her neighborhood, and all things public health. Rachel is a graphic designer for a local Twin Cities company. Born and raised in central Minnesota, she has a love for nature and a passion for keeping the earth a beautiful place. In her spare time, Rachel enjoys going to concerts and exploring the many fantastic breweries around MPLS/STP. Sadie joined TCFJ with a healthcare background and currently is employed as an emergency room scribe and surgery scheduler. She is passionate about providing access to fresh produce to communities in need as it can also decrease health conditions directly affected by diet. She hopes to further expand local awareness about food waste and food insecurity through TCFJ. When not rescuing food or fighting for social justice, she is spending time with her family, friends and dog, Scout, while enjoying all NE Minneapolis has to offer. Selena has worked for 14 years in the photography, video, arts, creative project management, and education fields. In her role at TCFJ, she helps invent and implement new programs and serves as photographer and website designer. Selena is glad to be part of an organization that cares about social justice and public health and allows her the opportunity to take immediate action in creating innovative solutions to food insecurity. Selena will be pursuing a MPH Nutrition in the Coordinated Masters Program at the University of Minnesota beginning in Fall 2019. 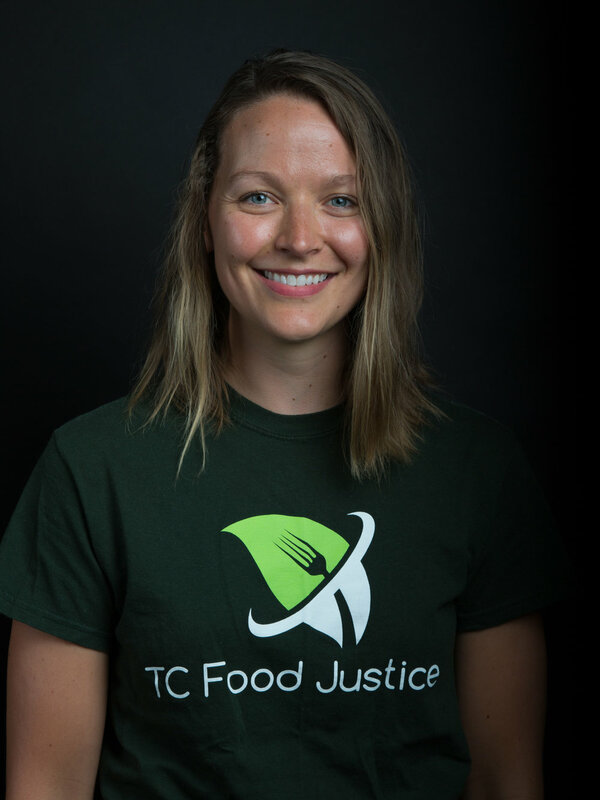 After working with TC Food Justice staff as a nonprofit recipient partner, Deandra knew she personally needed to join TC Food Justice's incredible mission! Deandra sees an abundance of healthy food and volunteer support in the Twin Cities and believes that by harnessing these precious resources we can create healthier, more sustainable communities. In addition to her work in nonprofit development and community engagement, Deandra loves getting herself wrapped up in creative projects, joining improptu dance parties and cooking tasty food for the people she loves. Anna is a recent graduate of the Community Health Promotion MPH program at the University of Minnesota’s School of Public Health . It was love at first food rescue for Anna, who has previously worked in childhood obesity prevention research, community organizing, and higher education. She hopes to continue to combat food waste and hunger in her future work. Heather has a B.A. in Psychology, B.A. in Women's Studies, and a Minor in Human Relations from St. Cloud State University. She is currently working on her M.S. in Nonprofit Management and Leadership with a concentration in Social Innovation and Entrepreneurship. Heather works at WeCAN as a Meals on Wheels Coordinator. She is new to the food world and is looking forward to working with volunteers and contributing to positive social change. Whitney sets up Chemistry labs at a local community college. Her love for sustainability started in college and still goes strong today. She came across TCFJ by hearing about it from some mutual friends and decided to apply. The groups mission of fighting food injustices while also helping the environment was inspiring and her love for the group only grew with each rescue. When not working with TCFJ, Whitney loves to be out hiking, biking, gardening and spending too much time nerding out about science. 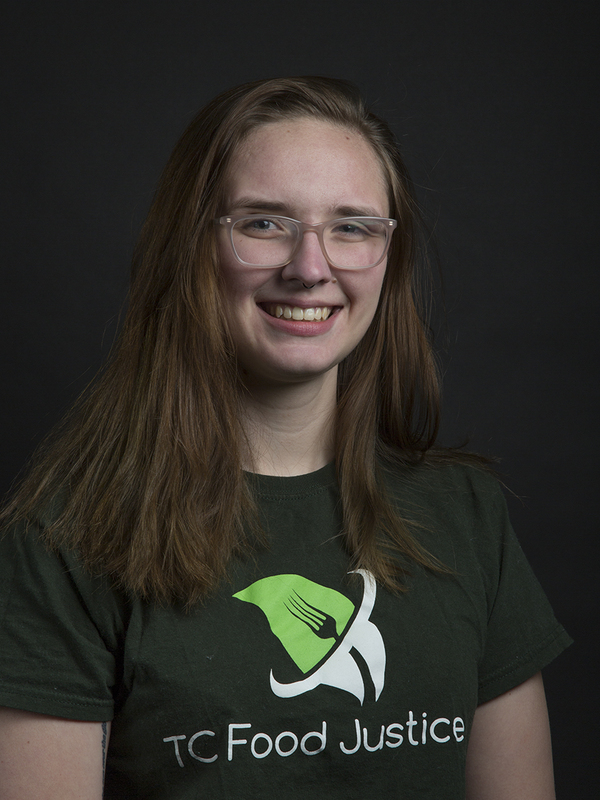 Kathryn has been working in the food service and agricultural industries in the Twin Cities for almost a decade and has been no stranger to the problems of food waste and insecurity. With her passions for sustainability, waste free living, and the Twin Cities community, the decision to join TCFJ’s rescue team and staff were a no-brainer for her. She spends her free time playing cribbage, napping with her cat, exploring the craft beer scene, and dancing to local live music. Autumn brings a diverse background and cross-sectoral connections to TCFJ with professional experience in the healthcare, philanthropy, communications, agriculture and government fields. She has nearly a decade of experience providing leadership and development services to non-profit organizations across the Twin Cities and is passionate about creating systems level changes to increase equity in the community. Autumn has a Master’s Degree in Healthcare Administration and is also a certified urban farmer. She has studied permaculture design principles and grown certified organic crops for local restaurants, farmer’s markets and CSA members. 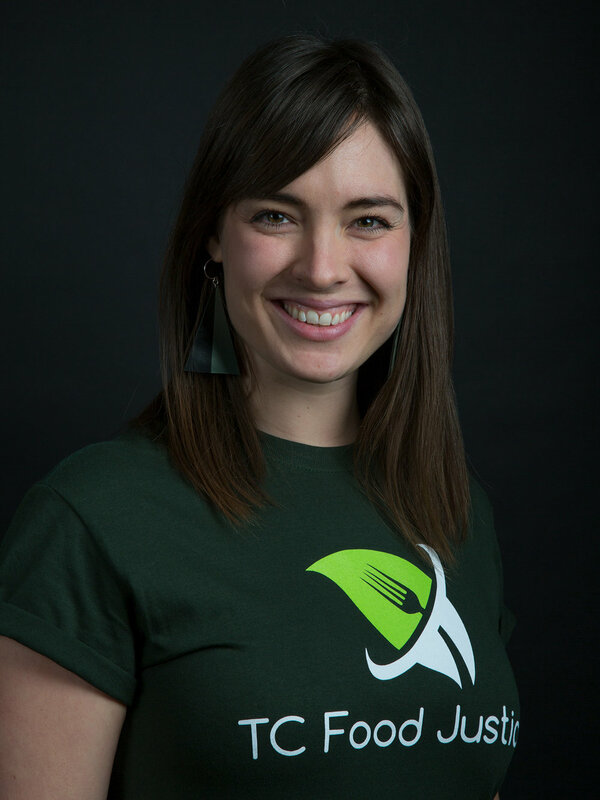 She has an in-depth understanding of the entire field-to-plate journey for food, with direct experience in every step of the process, and is hoping to use her knowledge to reduce food waste and increase access to high quality foods for all.